ASL have been serving London for the past 32 YEARS!! We offer a comprehensive 24 hr 365 day callout service. We can meet all of your security needs whether you are a domestic or commercial customer, providing a same-day service, usually attending within 15 minutes of a call out. 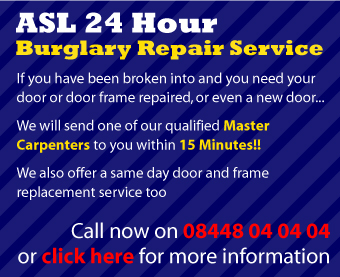 We also provide a 24-hour door opening service. Business and domestic customers can be sure that the service they receive will always be of this high standard ; our locksmiths have many years experience serving all three sectors of the market.